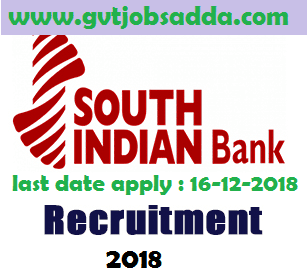 South Indian Bank Recruitment 2018 : South Indian Bank Has Published Recruitment Notification For Probationary Officers In Scale-I Cadre, On Successful completion Of Post Graduate Diploma In Banking & Finances (PGDBF) Program.Those candidates who are interested & eligible for South Indian Bank Recruitment 2018 Candidates may visit official notification for South Indian Bank Recruitment 2018 & Read all notification carefully and apply online before last date of online apply. Brief Information about South Indian Bank Recruitment 2018 , Has given below. X/ SSLC/ XII, HSC & Graduation with 60% marks Under regular course. Upper age limit will be relaxed by 5 years in case of SC/ST candidates. IBA approved pay scale of Rs. 23700– 980/7 – 30560- 1145/2 – 32850- 1310/7 – 42020 plus DA, HRA & other allowances (likely to be revised). Eligible for Performance Linked Incentive applicable to Scale I officers. The selected candidates can be posted in any roles/ profiles at any branches /offices/ departments as per the sole discretion and requirements of the Bank from time to time. The job role/ profile include branch banking, credit, business development, marketing, Forex, treasury , central processing centers etc.